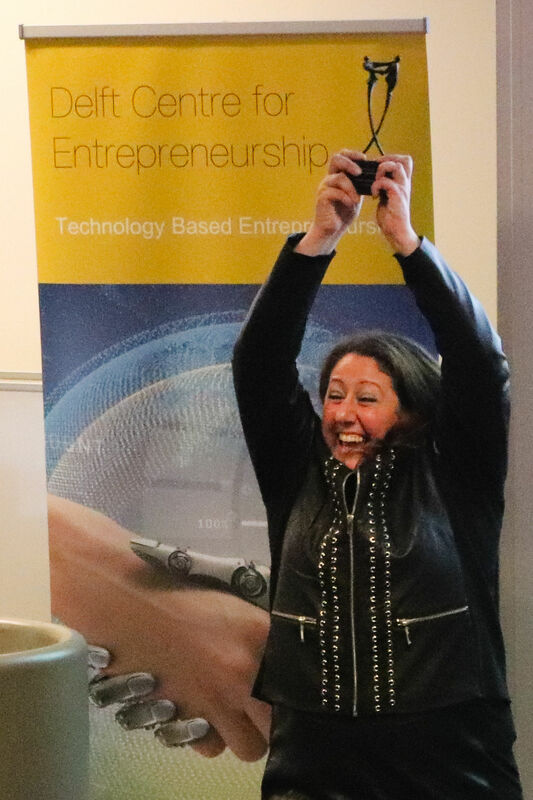 During the Female Ventures inspirational lecture on November 16, Eliane Khoury, founder and CEO of the company Virus Free Air (VFA Solutions) was honoured for her excellence and outstanding persistence in Entrepreneurship. Eliane developed her entrepreneurial idea, inspired by her MSc graduation project, some 10 years ago. In several entrepreneurship courses, such as Turning Technology into Business and Writing a Business Plan, which currently reside under the authority of the Delft Centre for Entrepreneurship (DCE), Elaine turned her entrepreneurial idea into a business which specializes in air purification. In front of a captivated audience (which had a 4:1 female:male ratio), Eliane gave an inspiring presentation about the difficulties (but also about the joy) of starting your own company. She highlighted some of the specific hurdles that female entrepreneurs must overcome, which was best summarized in a slide which showed her wearing many different hats: that of the entrepreneur, director, manager, strategic innovator, business developer, sales person, researcher, council, boss, and challenger. In addition, she wore four hats that you generally do not encounter in presentations by male entrepreneurs: friend, mother, wife, and woman. Eliane related how the tragic loss of her mother due to an airborne infection, drove her to persevere in building her company which fights these problems. Today, VFA produces installation equipment for farms, hospitals, logistics centres etc., all based on that entrepreneurial idea which she developed at the TU Delft. The Honoured Entrepreneur program at the Delft Centre for Entrepreneurship awards entrepreneurs from TU Delft for their business achievements and their contribution to socio-economic development. Honoured Entrepreneurs will be inaugurated in the Hall of Fame at the Faculty of Technology Policy and Management (TPM).